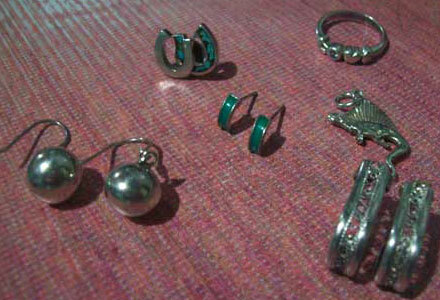 These sterling silver jewelries were the only ones left in my possession. They bring back good memories of my younger years. I started collecting them when I received my first pay check. I prefer silver over gold jewelries because they are simple to look at and don’t attract potential robbers in public places. Like gold jewelry, sterling silver jewelry can be customized. I prefer mine adorned with opaque blue-green mineral because of its antique effect. Turquoise is one of my favorite stones although diamond is my birth stone. This entry was posted in Jewelry and tagged silver jewelry, turquoise on December 5, 2012 by Mommy Yam.